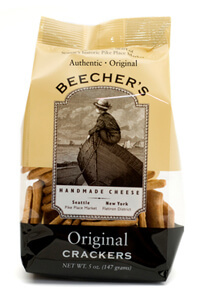 Beecher's Original Crackers are made from all natural ingredients and no hydrogenated oils. They are rich and buttery with a nutty sweetness and an excellent crunch. These gourmet crackers are wonderful as a snack on their own and will do great with all Beecher's cheese, click here to see them all. Ingredients:enriched unbleached wheat flour (wheat flour, niacin, reduced iron,thiamin mononitrate, riboflavin, folic acid), water, butter (cream, salt), cornmeal, distilled white vinegar, corn flour, cane sugar, salt, baking soda. Delicious. Great quality, crispy and has a definite pleasant cheese flavor.